Aylesbury Box Company can simply sell boxes to your business, but that is seldom the best option. Our preference is to gather a greater understanding of your products and your brand and advise on the most suitable packaging options. Aylesbury Box Company can simply sell boxes to your business, but that is seldom the best option. Our preference is to gather a greater understanding of your products and your brand. We can then apply our knowledge and experience to advise on the most suitable packaging options. We offer a full packaging design service. Using cardboard engineering skills, we come up with solutions that are the ideal fit for your range. We know how a few minor amends to a standard template can tick more of your boxes, without stretching your budget too far. You can also come to us when you want to make a statement, as we know how to create original packaging formats. At the design stage, Aylesbury Box Company provides advice on ways to achieve your desired outcome. It is often the case that there is more than one option. We’ll work with you to find the solution that fits the bill. Beige cardboard boxes are far from inspiring, but the paper-based material is receptive to a range of prints and finishes. This means that a humble box can be transformed into all kinds of exciting and informative packaging. Aylesbury Box Company can print branding and instructions on delivery boxes for e-commerce business. We also manufacture shelf-ready packaging and point of sale displays for supermarkets, shops or exhibitions. Whatever your printed packaging requirement, colour, font, pattern and imagery will enhance brand recognition and help to get your products noticed. When your order has been placed and the packaging has been manufactured, we provide a delivery service to your warehouse. Boxes are supplied flat packed and if storage is an issue, we offer a stock holding service. We can deliver the next part order at an agreed time, or you can get in touch when supplies are running low. All customers are served by a dedicated Account Manager. It is their job to get to know your business and understand what you need. One size does not fit all, so we work to find the ideal packaging solution to match your priorities. When it comes to re-ordering, a call to your contact will make the process quick and easy. If you require the full service, you need more than a packaging supplier. 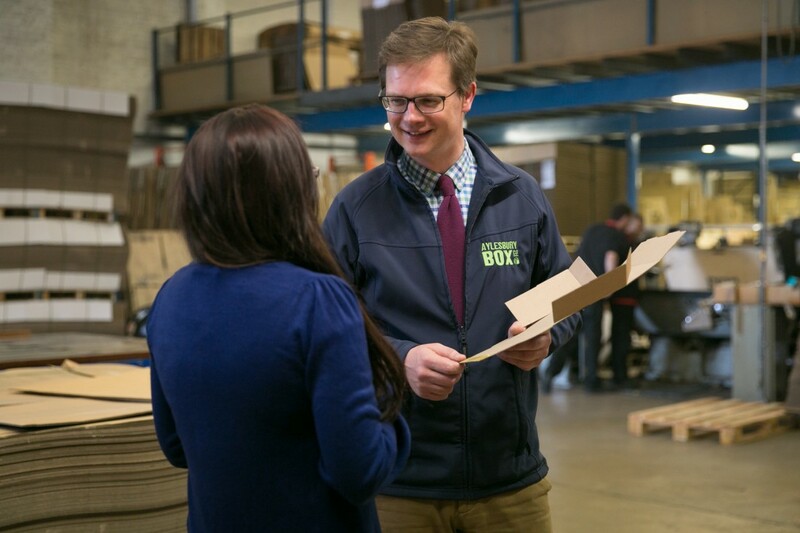 As a box manufacturer, Aylesbury Box Company is here to assist; call us on 01296 436888.